This month, my blog will feature guest posts from several Christian bloggers. Today’s post is written by Gail Goolsby. Goodbye to lazy days of summer and vacation leisure. Hello to set schedules for kids and adults. Time for school and daily routines. Fall is here. Freshly sharpened pencils. New clothes and unscuffed shoes. Sports teams with unblemished records. Blank report cards ready to register best grades ever. Fall presents new opportunities. Make the most of Self-Improvement September by focusing on areas of your life left unattended over the summer or needing a reboot. Here is a brief checklist to get you started. Take inventory. Identify dissatisfaction with your current life patterns and habits. Ask God what could be working better in your relationships. Physical and emotional health? Career activity? Home tasks? Spiritual growth? Recognize feelings but focus on actions. Feelings are important and you need to read the signals they send. But, in truth your actions impact your feelings and so behaviors should be assessed with sound reasoning. Feelings change easily and can form a trap and hindrance to life satisfaction. What actions need to be ramped up or altered to feel better about your life? Check self-talk. Do you constantly criticize or speak negatively to yourself? Do you cheer yourself through hard tasks or easily give up and then berate your poor performance? Taking on new challenges requires a positive attitude and ongoing encouragement. Remember past accomplishments more than recent failures. Set steps for reaching goals. Once a plan of action is formulated toward self-improvement, smaller, measurable steps are needed at regular intervals. Celebrate small successes as you inch toward your goals. Utilize resources. Prayer and God’s Word offer powerful inspiration and reminders of Who is always working for your good (and His glory!). Friends, co-workers, life coaches, and family members can be earthly gifts of accountability and encouragement. Let them celebrate with you as they support your efforts (and maybe join you in their own self-improvement goals). Embrace hope. Keep your head up and recognize each day signals possibility and hope for better. Look for God helping you in small and big ways. Tell yourself this truth, you can improve. 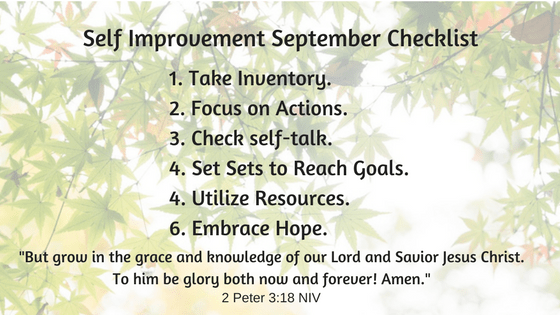 Kick yourself into gear and make September a trophy month of self-improvement! Gail Goolsby, MA, MEd is a lifelong educator, including past leadership at an international school in Afghanistan. Gail and her pastor husband of 39 years live where the wind blows over the prairie in south Kansas. She counsels and coaches using God’s Word to help others learn to live well. Read more at www.gailgoolsby.com. ←Where Does that Grin Come From? Self care is important yet it’s easy to let it slip by. Thanks for stopping by! Self-care is one of the things that has been on my mind lately. I especially like Gail’s advice to make note of our feelings but not to let our feelings have the final say. I appreciate your insights. Thanks! Thank you, Nancy, for publishing my article!